1. One of the most fascinating ways to decorate Christmas car is use to lamps, if you own a big vehicle it’s the best way to use light pipes and lamps. 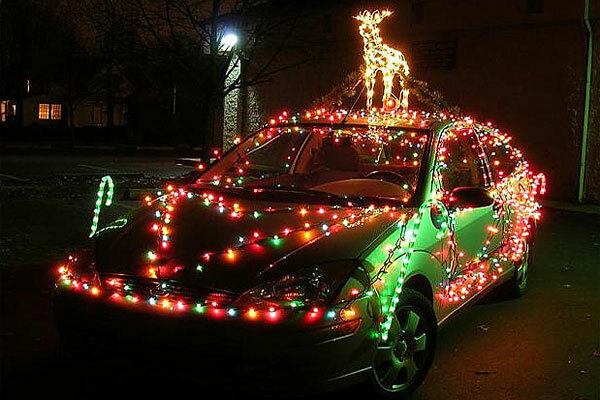 With such decoration, your vehicle will look so cool on Christmas Eve. 2. Christmas and Snow are related to each other, you can use artificial snow to decorate your car. Additionally, you can also use green decorations and colorful flowers especially on bonet and hood. 3. Christmas a gift is the main part of this auspicious event and one can make car appealing with the decoration of gifts on the top of car. 4. You can also place colorful gifts inside your car and on the hood of your vehicle place and fix symbolic gift box wrapped by colorful wrapper. 5. Everyone love Santa, you can also use it to decorate your car. You can place a Santa on rear side of your vehicle and also on Hood and Bonet surrounded by Red light or flowers. 6. Use of Christmas tree can be a nice idea; you can even use stickers of Christmas trees and fix it on bonet with use of other decorative items. 7. If you want to decorate your Car in a classic way, use black in white plastic papers, daffodils, lamps and tree to make it classic. 8. Buses and Trucks can be decorated in wonderful way with the use of Santa especially its face on the front side. 9. If you want to buy a new car and want to give surprise to your family members decorate it like wrapping and bow on the hood with dummy Santa and snow. 10. Santa cap is also among main point of attractions of Christmas, you can use a big Santa cap on hood to decorate Christmas car. A part from this, stickers of “Merry Christmas” can be used on front and rear side of car. Merry Christmas in advance, enjoy a cool and cozy Christmas and full this year’s Christmas with lots of happiness and surprises for your loved ones.